Calls are growing for Republican Ben Carson to quit the 2016 race after he said a Muslim should not be president. BBC reported that Muslim-American groups, among others, have said these views make him unqualified to run himself. Mr Carson, a Christian, made the comments on Sunday, adding that Islam was inconsistent with the Constitution. Another Republican presidential candidate, Bobby Jindal, said on Monday a Muslim president should swear on a Bible to uphold the Constitution. He said a Muslim Republican who fought to protect religious liberty, respected the Judeo-Christian heritage of the US and was committed to destroying Islamic State and radical Islam, and condemned cultures that treated women as second class citizens would get his vote. But they must “place their hand on the Bible and swear to uphold the Constitution”, he added. The Republican candidates for president are being asked about their views on Islam since Donald Trump failed last week to correct a supporter who said President Barack Obama was a Muslim. Mr Trump, the Republican frontrunner, has since said he would have no problem appointing a Muslim to his cabinet. But in an interview with NBC’s Meet the Press, Mr Carson said the president’s faith matters if it differs with the values of America. 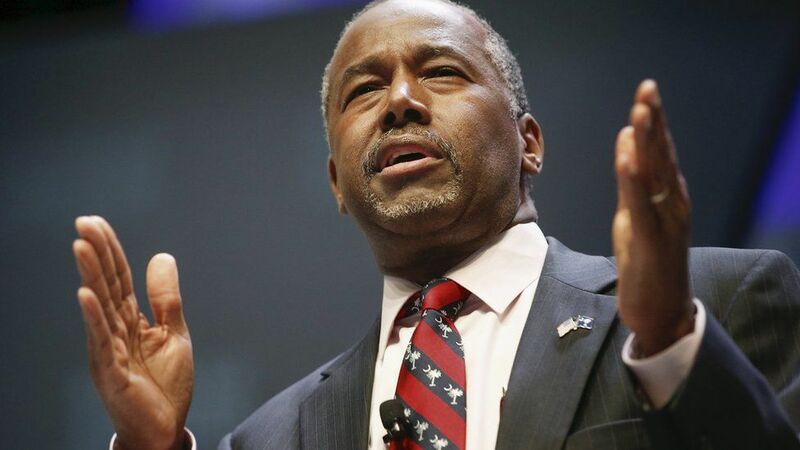 I don’t know whether Dr Carson’s words will bolster his position among the base after a somewhat lacklustre performance in the Republican debate last week at the Ronald Reagan Library – but what about the feelings of the three million Muslims who live in America? How is it going to feel to have a serious political figure, someone who aspires to lead this nation, essentially saying being Muslim is un-American? These people who day in, day out serve their communities, support their families, enrich the lives of fellow citizens and make America the successful melting pot that it is. Democrats immediately denounced his remarks and Muslim groups called on Mr Carson, a neurosurgeon who is riding high in the polls among Republican voters, to quit the race. “To me this really means he is not qualified to be president of the United States,” said Ibrahim Hooper, spokesman for the Council on American-Islamic Relations (CAIR). He noted that the US Constitution specifically does not require the president to have a certain religion. Farhana Khera of Muslim Advocates said the “religious bigotry” was heard when JFK was hoping to be the first Catholic president. And Haroon Moghul, a leading commentator on Islam, told CNN: “I think Carson’s comments mean he should get out of the race”. One of the latest polls, run by CNN/ORC, shows Mr Carson has slipped into third place in the Republican race, trailing former Hewlett-Packard chief Carly Fiorina and Mr Trump, who has consistently remained ahead of the pack. Senior Republicans had said after the 2012 election that if the party did not become more inclusive, it would continue to push away young voters. Should a Muslim be US president? Hillary Clinton: “In a word: Yes. Now let’s move on,” the former secretary of state said on Twitter. Ted Cruz: “The Constitution specifies there shall be no religious test for public office and I am a constitutionalist,” the Texas senator told an Iowa public television station. Lindsey Graham: “I think Dr Carson needs to apologise,” the South Carolina senator told Fox News. Mike Huckabee: “I don’t think we ought to just disqualify from somebody because of his or her faith,” the former Arkansas governor told Fox Business Network. John Kasich: “The most important thing about being president is you have leadership skills, you know what you’re doing, and you can help fix this country and raise this country,” the Ohio governor said on NBC’s Meet the Press. Rand Paul: “I try to see that as a separate thing, someone’s religion. I just think it’s hard for us. We were attacked by people who were all Muslim,” the Kentucky senator told CBS News. Bernie Sanders: “People should be elected to office based on their ideas, not their religion or the colour of their skin,” the Vermont senator said in a statement. Donald Trump: “Some people have said it already happened, frankly,” the real estate mogul said on NBC’s Meet the Press. Bobby Jindal: “If you can find me a Muslim candidate… who will place their hand on the Bible and swear to uphold the Constitution, then yes, I will be happy to consider voting for him or her,” the Louisiana governor said in a statement. Ben Carson: “I would not advocate that we put a Muslim in charge of this nation. I absolutely would not agree with that,” the retired neurosurgeon said. cAfmp9 Of course, what a great site and illuminating posts, I surely will bookmark your website.All the Best! I抦 impressed, I must say. Actually hardly ever do I encounter a weblog that抯 each educative and entertaining, and let me inform you, you may have hit the nail on the head. Your concept is outstanding; the issue is one thing that not sufficient people are speaking intelligently about. I’m very glad that I stumbled throughout this in my seek for something referring to this.